Sunday March 27th 2016: You could sense the excitement in the air in Tokyo, but it wasn’t the first signs of spring; the warmer weather or even the ‘Sakura’ blossoming, it was the anticipation of another massive game for the Cru; this time a friendly at the Sankei Misato ground, against the familiar opposition of Matsudo RFC. Unfortunately much of that positivity was evaporated by a Sunday morning 11am kick-off, which must surely be a handicap of at least 20 points against the Cru to start with. Indeed arriving at the ground it soon became apparent that we had barely managed to scrape together 15 players, mostly of whom were forwards, with several players letting us down, despite confirming their attendance. 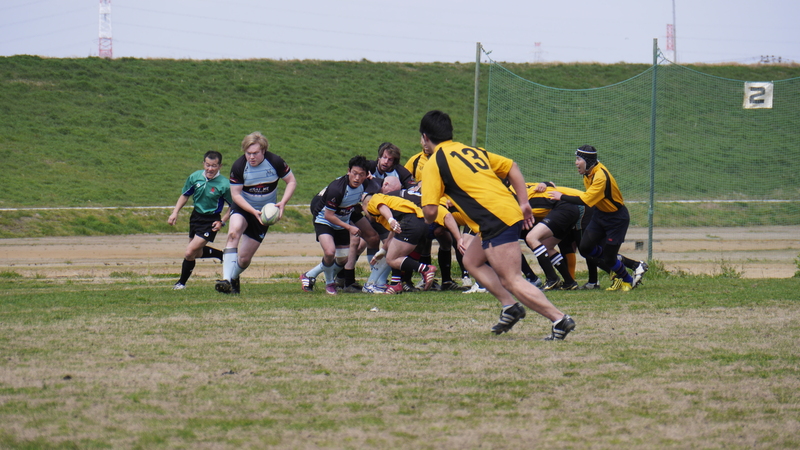 This meant that we had no subs and therefore our fitness (and hangovers) would be really tested… Matsudo also had a number of players missing, including their prop forward, so it was decided that scrums would be uncontested, effectively nullifying one of the Cru’s recent areas of strength. Perhaps it was the early kick-off, or the number of players forced to play out of their regular positions, but the game got off to an untidy start, categorized by a number of errors and breakdowns, with Matsudo being quick to win lose ball and especially strong at turning over Cru possession. Despite such a scrappy start and Matsudo dictating territory, keeping us pressed back in our own half, the Cru held on resolutely for over 20 minutes, including a fantastic try saving tackle from XXXXX(?) who managed to force their player over the line, when already clean through. After 25 minutes Matsudo finally made their pressure count, with some nice work by their backs allowing them to finally score the first try of the day. Unfortunately after holding out for so long, the flood gates opened, with Matsudo scoring two more tries and adding one conversion, to cap off a devastating spell of seven minutes and seventeen unanswered points. At this stage things could have become really ugly, but the score didn’t seem to reflect the quality on both sides of the pitch and the Cru did well to regain composure, exert some concerted pressure and rounded off a good spell, with Sebastian Forestiere scoring a nice breakaway try, right on the stroke of half time. Despite the failed conversion attempt, the strong finish lifted the spirits as we entered half time with the score 5-17 and some momentum back in our favour. As the second half got underway, we knew that we needed to keep things tight and try to close the gap. We started the half strongly and found ourselves camped just 5 metres out from their line, unfortunately we continued to make too many individual errors and after another turnover led to a Matsudo try, the frustration started to grow, both with ourselves and with some decisions that we felt didn’t go our way. We began arguing with the referee and it was during one of these moments that Matsudo reacted properly, taking a quick tap-and-go penalty and running the ball the length of the pitch to score, while several of our players were still interrogating the referee. After the game we were reminded in no uncertain terms, of the importance of playing to the whistle and only the captain talking to the referee and as we look forward towards the Tokyo Cup we will have to cut out this indiscipline. With no subs and some tiring bodies, the second half followed a similar pattern to the first. We were rarely outplayed, however we lacked that little bit of quality, or good decision making at vital moments. Finally we got some better support for our forwards and a couple of good pods and a strong rolling maul, led to an opportunity for Matt Sparrow to break and score under the posts, which he duly converted himself. However before any chance of a stunning fightback could materialise, another try and a nasty accidental injury to Christian Carillo, who had to be stretchered off, took the wind out of our sails and left us further exposed, allowing Matsudo to add insult to injury with a final score right on the full-time whistle. We later heard the sad news that Christian broke a bone and tore a ligament in his ankle and is now in plaster and unlikely to play rugby again. We all wish him a speedy recovery and hope to see him at social events or on the sidelines as he will always be part of the Cru. 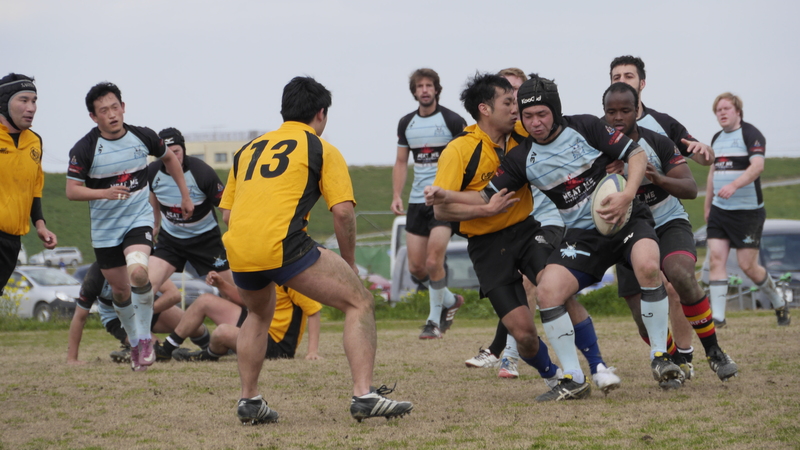 The final score was Crusaders 12 – 39 Matsudo RFC. The game was played in a great spirit throughout and there was a real sense of frustration from the Cru after the game; knowing that if we had just had a couple of extra players and could have cut down on some of the errors, we would have had a very good chance of giving them a close game. That said the 15 players who were present come out of it with a lot of credit for lasting the full 70 minutes and for the willingness of so many to play out of their regular positions. We voted for their big man; Kobayshi-san as MVP, as he proved a thorn in our side all day and didn’t stop running and in what appears to be some sort of big guy love-in, they returned the favour voting Foster-san as our MVP. To be fair Matthew Foster had another strong game and also took the prize of 5 points from the Cru 3-2-1 voting, followed by Rob (4 points), Sparrow (3 points), Stewart (2 points) and both Sebastian Forastiere and yours truly; Paul ‘butter-fingers’ Martingell (1 point). Thanks also to the referee; Mr. Seino, our linesmen; Ayako-san, photographer; Valentina and waterboy; Camilo.